This year, I’ve been working for the first time ever on actually decorating our home a bit for the fall season. I’ve always loved homes that are fully decked out for fall, but my home has never been one of them. I’ve got a full home tour coming up next week to show off all of the new things we’ve got in the house for the fall season, but today I thought I’d give you a little sneak peek of the wreath that I made for our front door. Wreaths are seriously one of the absolute easiest things ever to make yourself, and they are practically foolproof (I also made one for Christmas a few years back and it’s still as good as new!). To make the wreath, all I did was grab a rustic-looking plain twig wreath from Hobby Lobby, along with a few cute little faux florals. There are about a zillion different options for what you could put on it – I wanted to keep mine pretty simple, so I just grabbed some pretty leafy accessories and some faux berries. Then, all I did to put it together was grab my hot glue gun and go to town! 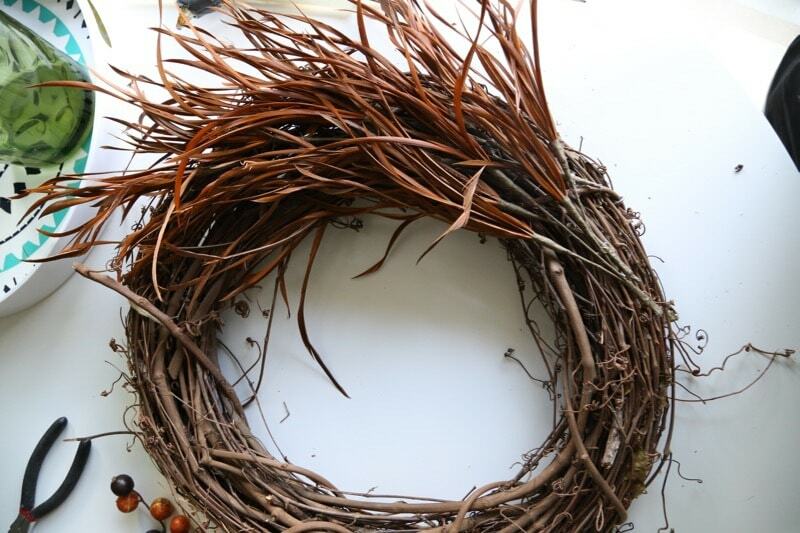 It is kind of tricky to get everything to stick well with the twig wreath since there are so many holes and open spots, but with a bit of patience (and a bit of extra glue) it wasn’t terribly difficult. I played around with a few different arrangements, but the one I liked best was simply layering the leaves on top of each other down one side of the wreath, then adding the berries at the bottom. 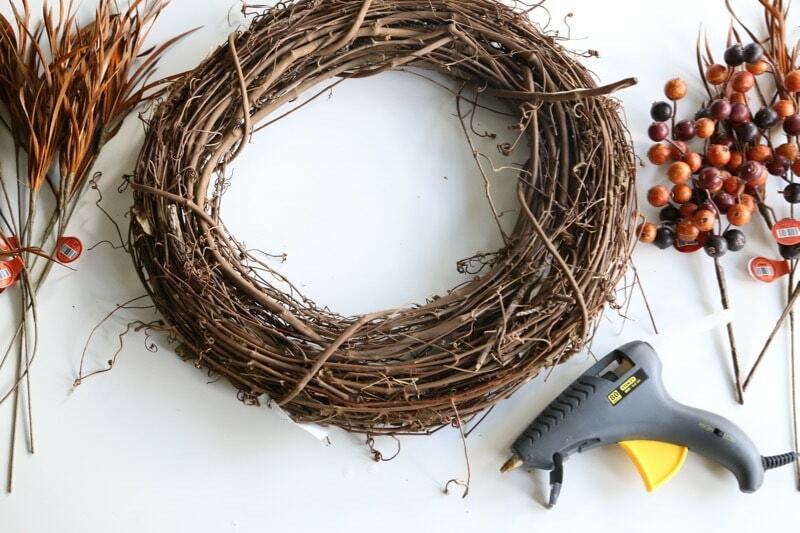 Be sure to use some wire cutters to trim the excess stems once you’ve attached everything to the wreath (there will be some that stick out at the bottom). I grabbed a cheap wreath hanger from the Christmas section of the store (I think it was $3.00, and then it was on sale too!) to hang the wreath on our door. Annnnnnd, done! This was so fun to make, and I think it is a really fun touch for our front door! Of course, now that I’m looking at these photos I’m noticing how dirty our door is! The paint job is really starting to look less than awesome, so I’m thinking in the next few weeks I may go ahead and give it a fresh coat of paint. I’m considering bringing the yellow around to the inside of the house too – what do you guys think? The front of our house can really use all the help we can give it – the paint job on the house as a whole is pretty terrible (and the color is not my favorite!) so it’s always fun to add little touches like this that make it look a bit nicer. You’ll also notice none of the photos are very pulled back because our front “porch (which is practically nonexistent) is super dirty and full of leaves that I haven’t had time to clean up since, like, last fall. Sigh. I’ll get around to it someday, right? Do you decorate for fall? Anyone else have a pretty pathetic looking home exterior? I love the wreath, simple but it makes an impact. I hope you keep the door yellow, I’m loving it! Thanks, Rhonda! 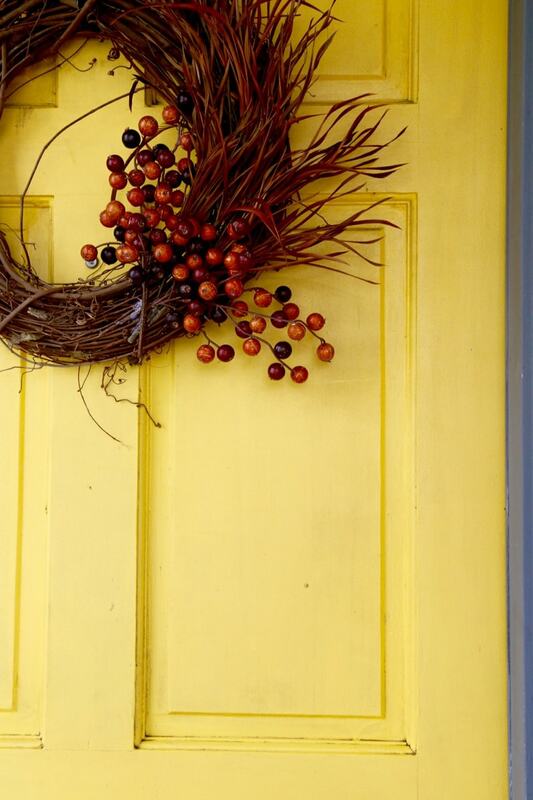 I love the yellow door too! 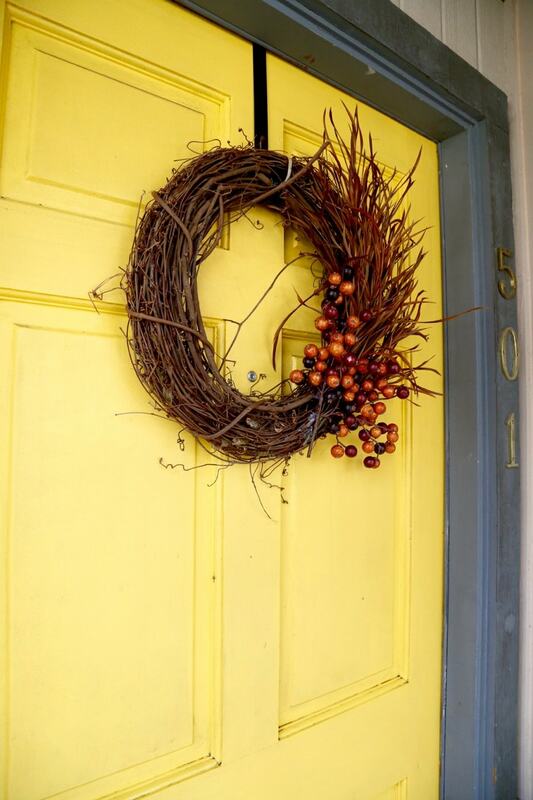 Love the wreath and how it pops against the yellow! Can’t wait to see the full fall home tour! 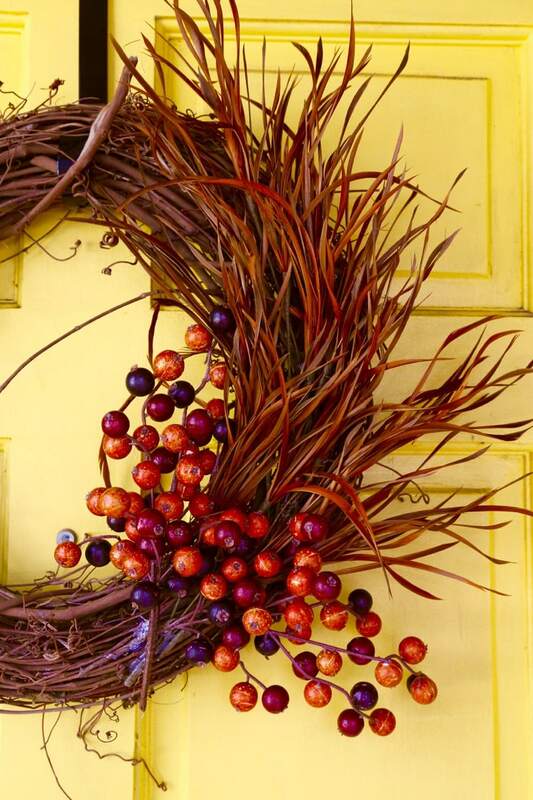 Your fall wreath looks amazing. I’m going to try and make one of my own now. 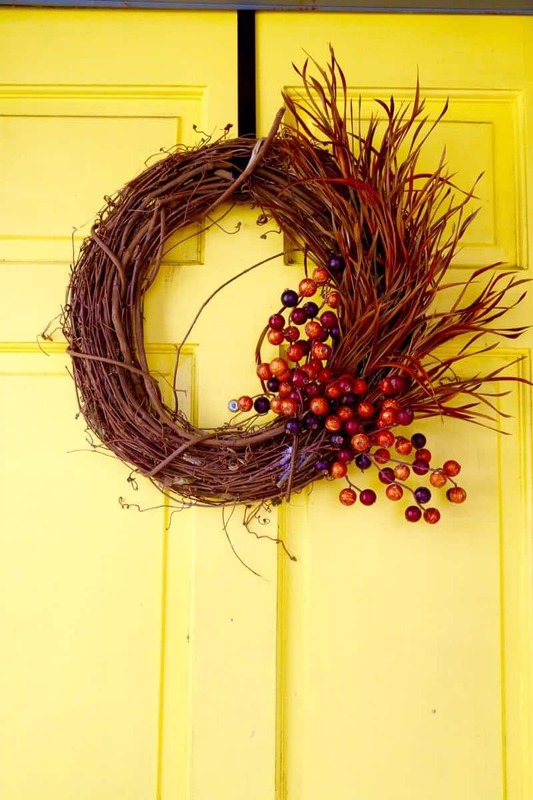 Your wreath looks great and I really love the color of your front door! I keep debating whether to bring my exterior inside too, but I just haven’t taken the plunge yet! How easy! This looks great, pinning! The wreath is so pretty and looks so easy! 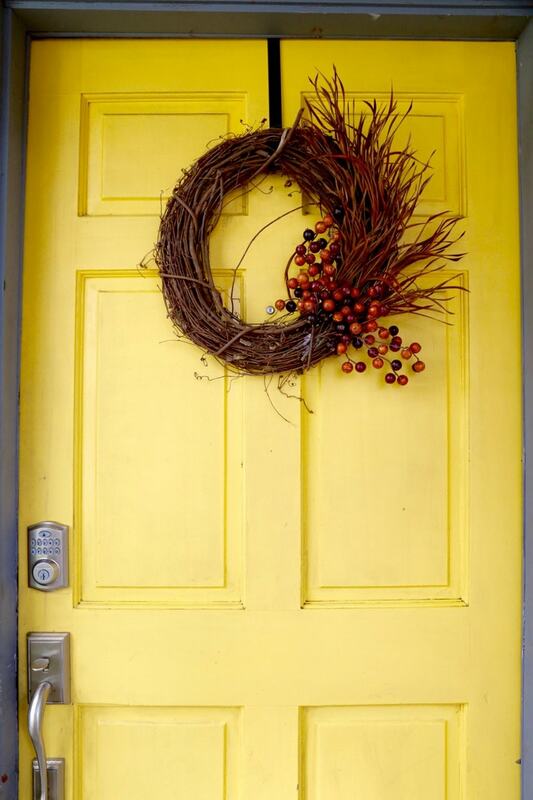 I also love the bright yellow front door! I love the simplicity of it and the leafy element almost looks like feathers. So pretty! Wow. This is gorgeous!!! Simple and stunning…. especially against that door!!! Happy Fall! I DIYed a fall wreath last year out of a wire hanger and some burlap! Love this one! I always love burlap for fall decor! That looks so striking! Really suits the fall ! Looks great especially against the yellow door! Can’t wait to see your other fall decorations. Thanks, Amy! We thought we were done but I think we’ll be adding some more in the next few weeks…I’m addicted now! This is such a great wreath! It is fall without it being too much! I just picked up a grapevine wreath and I’m still debating just what I want to do with it. I love yours, so pretty! And be warned, once you start fall decorating, you can’t stop!